Comments - One of the first 3D flight sims to take advantage of the 3DFX Voodoographics accelerator cards, which were new technology in 1998. 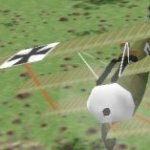 Red Baron 3-D is an engrossing recreation of the air wars over France in WW1. The style of presentation can't fail to educate as it entertains. With British, American, French and German services to fly in and a full complement of planes it represents hours of flying fun.